This is a project ongoing. At the moment it seems rather grand to claim this as European photography because most of my images are from Spain. However, Spain does hold much of Europe's wildlife species at some time of the year, particularly when the bird migration is underway - most of western Europe's bird migrants pass through the Straits of Gibraltar each Spring and Autumn. It is a place of highlands and mountains, from the Pyrenees to the Sierra Nevada, holding many of Europe's mammals, including the rarest: Wolf and lynx. It has a long coastline, often with a tropical climate attracting many species of butterfly, which in turn find a huge variety of plants to feed and lay eggs upon. All in all, Spain isn't such a bad place to start expanding a collection of images outside of the UK that includes many of the rarest and protected plant and birds to be found clinging on in the UK. Click on a photo to open a gallery. "I can think of only Scandanavia as well as Spain where rare British species can be photographed relatively easily and without a licence or fear of disturbance. This is because the UK has become crowded or ruined by thoughtless development and poor eco-management, leaving only isolated and much prized "reserves" that photographers and well-wishers are largely discouraged from visiting, or at least getting close to its rather artificial collection of biodiversity. Spain has no such artificiality towards its natural environment. Here, man is included as part of the environment rather than an alien". 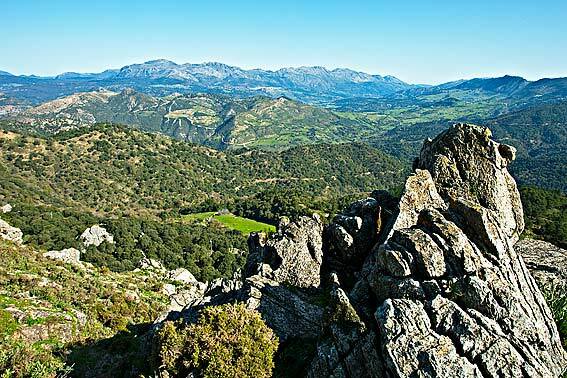 Andalucia, close to the tourist resort of Costa del Sol, yet despite the popularity of the beaches and nightclubs the natural environment is rarely visited or talked about. Information about its wildlife and even footpaths into its interior are little known or Googleable. It can be likened to one huge nature reserve without a guide. Where to find it's wildlife is for you to discover on your own largely by trial and error. A little bit like Scotland but without the rain - usually! Coto Donana is the exception to the above. The place is well known by birders and wildlife enthusiasts from all over Europe. It is a UNESCO World heritage Site. But I personally found it to be difficult for photography. It is also quite busy and a shock to anyone used to being on their own discovering what peace there is in nature. It is of course being exploited as a number one eco-tourist destination in Spain, which is a shame in one respect, but a saving grace in another. The saving grace is that better places exist for wildlife, and are left in peace. One such place is La Janda. Another is all the mountain tops in Andalucia. I shall leave it to you to discover these places for yourself for fear of ruining Andalucias best kept secrets.